In the previous article, I discussed my situation as a shoulder rehab patient. I wanted to continue using my set of weight plates but didn't want the dumbbell bars that will be awkward to use. So I fabricated my own physical therapy dumbbell bar using light materials. 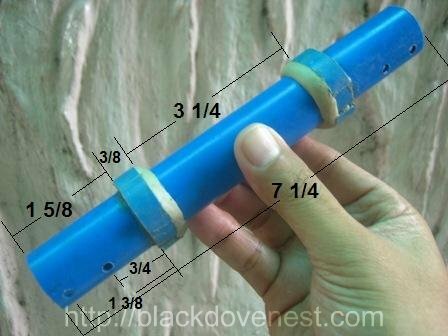 PVC pipe - 1" outside diameter, 8" long - 1 pc. machine bolt 1/8" thick, 2" long - 2 pcs. matching nuts - 4 pcs. screws - 1/4" long - 4 pcs. Shown below is the PVC pipe and the 2 bolts with a couple of matching nets per bolt. Note: The dimensions outlined below are measured for me and I have small hands. So adjust dimensions as needed. 7 1/4", 1 pc. - This will form part of the dumbbell bar rod. 3/8", 2 pcs. - These will be assembled to become the dumbbell bar's shoulders. 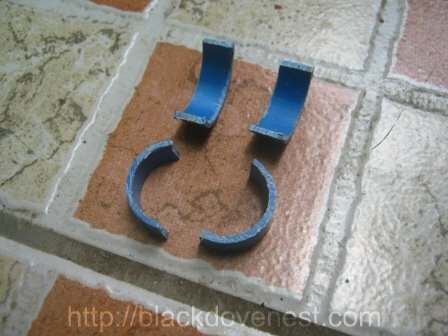 Take the 2 pieces of 3/8" lengths and cut them in the middle with a hacksaw. You will now have 4 pieces as shown below. Smear heavy duty contact cement on the inside of the 4 pieces and attach them to the 7 1/4 long pipe. Position them at a distance of 1 5/8" from the end of the dumbbell bar as shown below. Pry the pieces a bit to wrap them around the dumbbell bar. A masking tape will help hold the pieces together until the adhesive dries. An alternative dumbbell shoulder is to cut pieces of ANOTHER pvc pipe that has an inside diameter of 1" (or the outside diameter of THIS pipe). Once the adhesive is completely cured and dried, drill a couple of 1/8" holes along the length of the bar on both sides as shown below. The 2 pairs of holes are at a distance of 3/4" and 1 3/8" from the dumbbell shoulder. 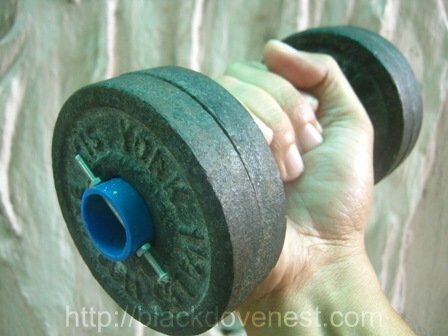 Mix epoxy clay and apply at the joint where the dumbbell handle and the dumbbell shoulder meet. The epoxy clay should taper to the protruding ridge of the shoulder. When hardened, this will smooth out the rough and sharp edge of the dumbbell shoulder, thus resulting in a more comfortable grip. For additional comfort, you could also add a foam pad like the one I used for cushioning a wrist roller. A grip tape like the ones used for padding tennis or badminton racquet handles will also work. When the epoxy has cured and dried, reinforce the dumbbell shoulder's attachment. Drill 1/16" pilot holes on opposite sides of the dumbbell shoulder. 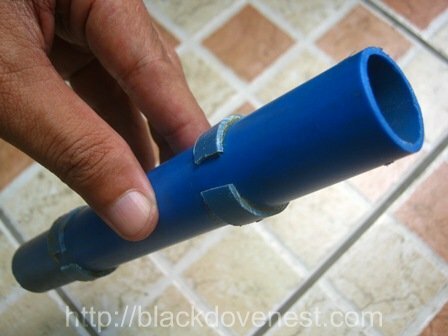 Drill through the dumbbell handle (pvc pipe) as well. 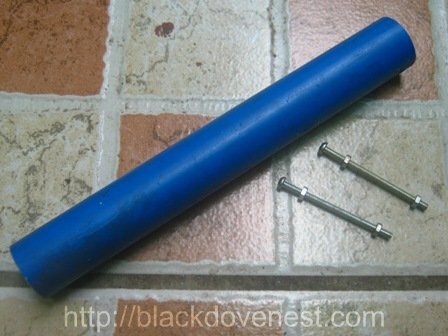 With a screwdriver, insert a 1/4" long screw to fasten the dumbbell shoulder and the pvc pipe together as shown below. This will secure the dumbbell shoulder to the pvc pipe. Do the same at the opposite side, as well as on the other dumbbell shoulder. Now you're ready to use the physical therapy dumbbell bar. Load the weight plates on the dumbbell bar sleeves. Insert the bolt in the appropriate pair of holes. You have the option of a single plate load like the one below. or a double plate load. The two nuts are positioned 1/2" from both ends of each bolt. They secure the bolt on both sides of the physical therapy dumbbell bar's sleeve. 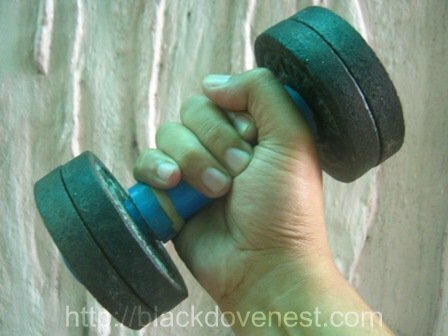 Use the dumbbell normally for the exercises. The physical therapy dumbbell bar can accommodate up to 4 pieces of 1.25 lb. weight plates. The 1.25 lb. plates are roughly 1/2" thick. With regular normal use, the dumbbell bar is able to withstand the maximum weight. The following photo shows how the physical therapy dumbbell measures up in size to the rest of my store-bought dumbbells. Compared to the gym dumbbell bars, the physical therapy dumbbell length is significantly shorter, allowing more freedom of movement. 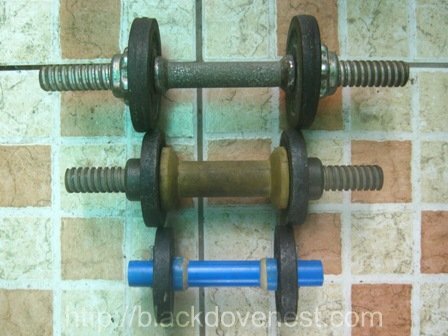 The weight of the dumbbell bar (pvc part) is almost negligible to therapy exercise. So the total weight of the loaded plates is the relevant weight to be considered.